We got a call from a very nice man, owner of Just Sew Sports out of Oconomowoc, WI looking to accomplish a very interesting project. 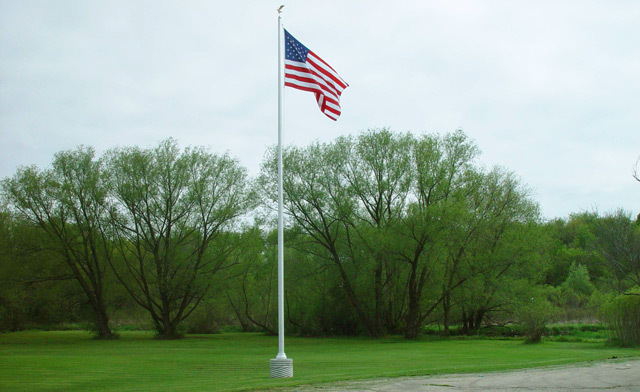 He was recently given a 44 ft. shaft which was intended to be a flagpole, but was never used. The only problem was that the 2-piece pole had been left to sit outside on the ground and was heavily stained. More importantly, all the parts that made this a flagpole were missing. He needed to clean up the pole and re-outfit it with all new parts. 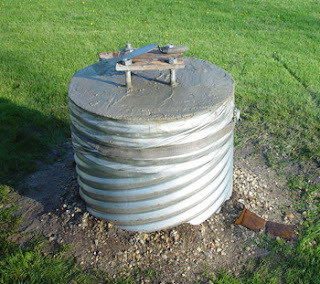 Outside his home, was a large galvanized pipe wide enough for a man-hole. This pipe was set straight into the ground with nothing on the inside for several feet. Bob decided to use this as a base. Great idea. He decided to have a shoe base welded to the bottom of the pole. He brought it into the shop and also had the pole re-spun to remove the stains. So he used fence post as re-bar connecting to anchor bolts for a shoe base type installation. 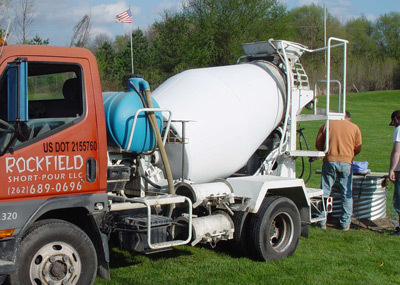 Finally he had a short run cement truck (Rockfield Short-Pour, LLC.) 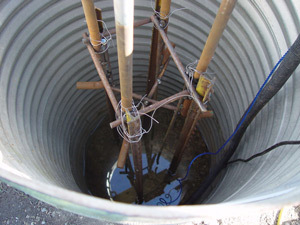 come in and fill the galvanized tube with concrete making sure the anchor bolt form was set. He assembled and raised the pole making it a total of about 46 feet tall, flying an 8 x 12 ft. US nylon flag. Terrific installation job! Bob, owner of Just Sew Sports runs a nice community business in town and is a really great guy. Being a long-time flag flyer, it was important to him to get this job right and put up a really nice flag display. Sometimes these projects can become overwhelming at first, but where there is a will, there is a way. Bob proved that. This wouldn't have happened without the help of neighbors and friends. Kevin for drilling the hole, Tim and Cody for helping to erect the flagpole.